If you have been watching BBQ Pitmasters on TLC, then you saw Myron Mixon's "muffin pan chicken thighs" or "cupcake chicken". Chris Lilly has a similar recipe on a larger scale in which you put a whole chicken in a bread loaf pan. We tried it out last night. 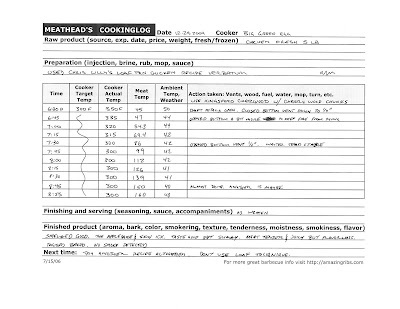 Recipe via Today Show appearance. 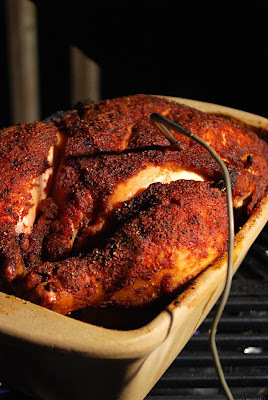 Have you ever tried a beer-can chicken recipe? That’s when a whole chicken is perched atop a beer can and set on the grill, so the beer steams from the can and keeps the sitting bird from drying out. The results are tender and moist, but sometimes the flavor is washed out; and if the chicken falls over it can be a mess. Loaf-Pan Chicken is a dummy-proof alternative to beer-can chicken, although the technique is not as gimmicky. You simply set the bird in a loaf pan and place it, pan and all, on the grill. The loaf pan captures all the juices and increases the humidity surrounding the chicken. The result is tender and moist meat every time, and best of all, the flavor is full and undiluted. Build a fire (wood or a combination of charcoal and wood) for indirect cooking by situating the coals on only one side of the cooker, leaving the other side void. In a small bowl, stir together the applesauce and Worcestershire. Holding the chicken over a 9 x 5 x 3-inch loaf pan, pour the mixture over the chicken, making sure the chicken is thoroughly coated both inside and out. Let the excess liquid drip into the loaf pan. 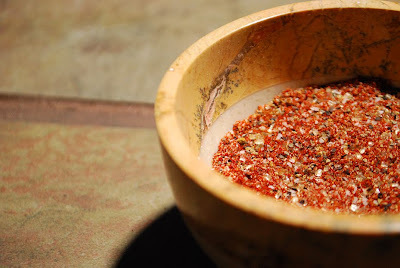 In another small bowl, combine the dry rub ingredients and mix well. Coat the entire chicken, both inside and out, with the dry rub. Place the chicken into the loaf pan, breast side up. When the grill temperature reaches approximately 300° F, place the loaf pan on the grill grate away from the coals, close the cover, and cook for 2 hours, or until the internal temperature of the chicken thigh reaches 175° F. Let the chicken cool a bit in the pan before cutting into serving pieces. I'll preface this by saying that every other recipe I have tried from this book and I have tried many, has been very successful. This one, not so much. The seasonings were bold, I liked the potential flavor profile. Bird "nested" away in the loaf pan, cooking on the Big Green Egg. The meat was perfectly cooked and juicy, but it was bland. The flavor seemed to stay with the skin, which was rubbery, not crisp at all. Part of the problem is that the juices from the chicken stay in the pan and start parboiling the bottom half of the chicken while the top half is roasting. On the bright side, the juices from that pan last night made the best chicken gravy I've ever made. It was fun to try as something different, but in my opinion, a spatchcocked (butterflied) and smoked chicken produces much better results.